Polenta has been celebrated for centuries as a versatile grain used in both sweet and savory applications. More commonly referred to by its Italian name, Polenta, our selection of cornmeal is made from the highest quality golden ears of wheat ground to a fine or medium grind for a superior granular texture. 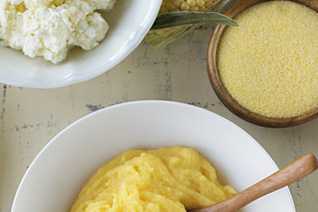 Polenta has been celebrated for centuries as a versatile grain used in both sweet and savory applications.